It’s Spirit Week at Da Vinci Design! The themes are listed in the update below. 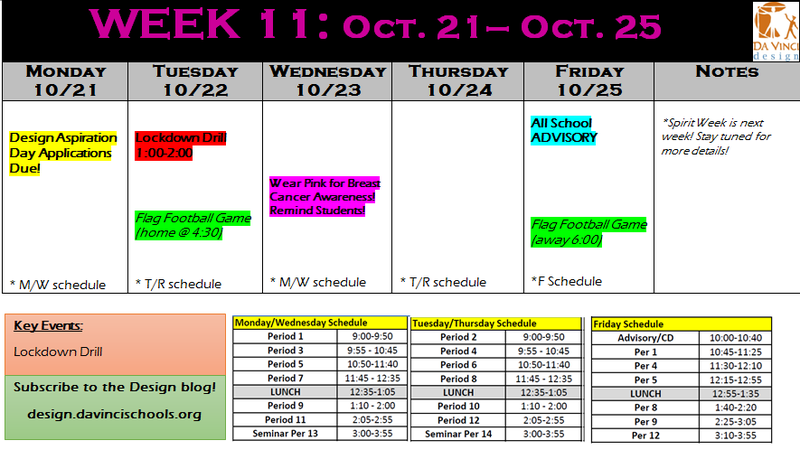 Looking forward to a week full of school spirit and fun! 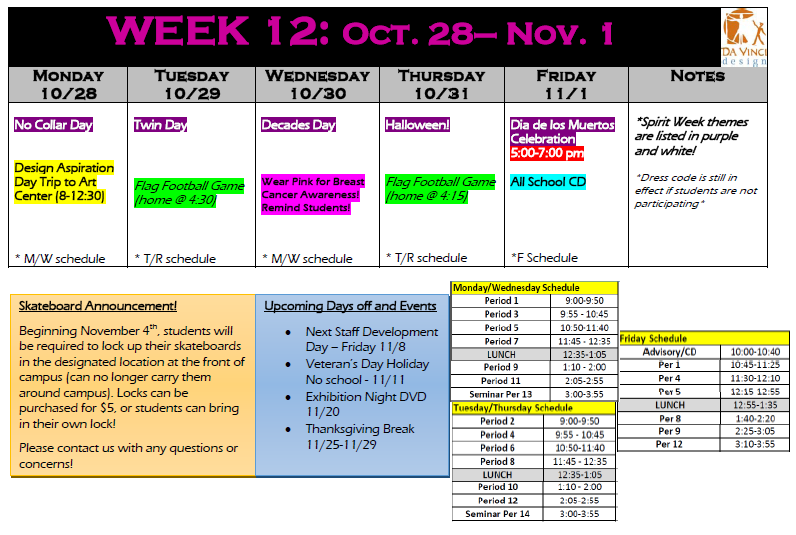 If your student brings his or her skateboard to school, he or she will be required to lockup the board starting Monday, November 4th. We have a lockup station ready to go. We simply ask that the student provides his or her own padlock. We have a limited number of $5 padlocks for sale in the Principal’s office. If you have any questions or concerns, please contact kparsons@davincischools.org or manderson@davincischools.org. As you may already know, our 10th and 11th grade students took the Preliminary SAT exam on Wednesday, October 16th. This exam is a standardized test that provides firsthand practice for the SAT. It gives access to college and career planning tools and for 11th graders, a chance to enter scholarship programs. The fee for this exam is $14 per student tested. If we have not received the payment or an email regarding the inability to pay, we plan to withhold the results of your student’s exam. For this reason, we ask that you send the $14 payment as soon as possible. In addition, we hope to set up parent access on all student Naviance accounts. Naviance Family Connection is a comprehensive web-based resource designed especially for students and parents. Family Connection allows access to college information including college and major searches, scholarship searches, career tools and a resume builder. It is linked with college application data so that the counselors can electronically submit transcripts and recommendations directly to colleges for college admission applications. To do this, we need your most current email address. Your son or daughter will bring home a letter regarding this topic on Monday. Please provide the required information and ask your student to return the form to their History teacher by Friday, November 1st. Thank you for all of your support! If you have any questions or concerns, please do not hesitate to email Megan Anderson at manderson@davincischools.org. SENIORS! 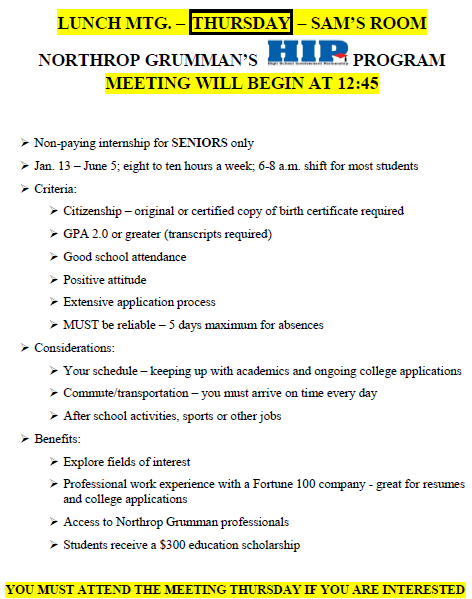 Northrop Grumman HIP Program Internship Opportunity! Get the yearbook at the best price of the year! Reserve a copy of the Da Vinci Design yearbook for your student. Now through 11/15/13, get it for $46, the best price of the year! Da Vinci Design’s next Family Association Meeting is this Tuesday, October 15th at 6 pm in Jessica Jones’ classroom.The topic is Da Vinci Accountability. Here is your Week 10 Update for this week’s upcoming Da Vinci Design events! 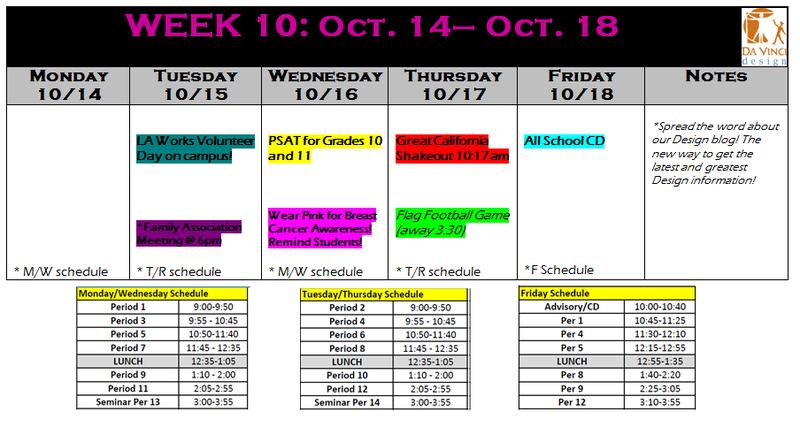 Major events this week include the Family Association Meeting, the PSAT, and the Great California Shakeout (earthquake drill). See below for more details. *Please Note: LA Works is an organization that is donating supplies and resources to help out with a few campus projects! Photos to follow! Students have the opportunity to apply for a field trip to Art Center Pasadena for Design Aspiration Day on Monday, October 28th! Da Vinci Design students were invited and will see a presentation by D’Wayne Johnson (an experienced and well-respected shoe designer from LA) as well as take a tour of campus and get a better understanding of their Design programs offered. Applications are available in the front office and are due no later than Monday, October 21st! Permission slips will be provided upon acceptance. There are hundreds of ways to be a creative person, and we would like to introduce your students to some of these options. Please join us at Art Center College of Design for a presentation and Q & A with D’Wayne Edwards, former footwear Design Director for Jordan Brand, a division of Nike Inc. In addition, we will familiarize your students with the range of visual arts career options and provide a tour of the campus. D’Wayne is originally from Inglewood, California and pursued a career in footwear design despite a host of obstacles. At age 19, he began his career as a file clerk for LA Gear, but soon started designing shoes for them. By age 30, he had moved on to become one of the youngest Design Directors for Nike. There he designed versions of the Nike Air Jordan and has created shoes for professional athletes such as Carmelo Anthony, Derek Jeter, Michael Jordan and teams including the US and China Olympic Teams. In a career spanning over 2 decades, he has designed more than 500 shoe styles and combined, his designs have sold for more than $1 billion worldwide. Currently, D’Wayne runs Pensole, a one-of-a-kind footwear design school headquartered in Portland, Oregon, and has an affiliation with Art Center. We hope D’Wayne will inspire your students as he provides them with some great information about product design and related fields. ATLAS BLOCK PARTY! Only $3/person! What: Come and enjoy simply hanging out! Food, games, and music will be readily available. Then, at sunset, we will screen a surprise movie – but you won’t know until right before it starts! Cool movie, great music, and tasty food – great times guaranteed! When: Thursday, October 10. Gates open at 6PM and close at 6:30PM. The film should conclude around 9:30PM. Who: This great event is open to all Da Vinci students and family members! Sorry, no dogs this time! Why: All proceeds for the event will go directly to the Atlas Program, an emerging program on campus that offers the students an option to travel abroad but first and foremost challenges them to use creative and design thinking to solve some of the world’s most difficult social problems – it’s a traveling spin on service learning and project based learning! Tips: It may be chilly out, so bring a sweater. Since a movie will be screened outdoors, seating is only available on the lawn. Bring blankets, pillows and anything else that will make your viewing experience more pleasurable! No chairs higher than 6″ please!